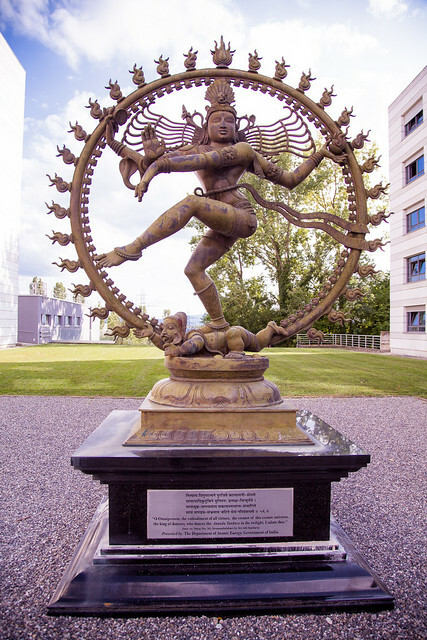 Nataraja at CERN | Flickr - Photo Sharing! Known as the Nataraja, this particular form of the Dancing Shiva is one of the greatest gifts to the world of art. Shiva symbolises "Shakti" or life force, in the Hindu Trinity. He is the Creator, the Sustainer, and the Destroyer. Beyond the Nataraja's artistic form lies a profound meaning to be comprehended at many levels. The Nataraja in Ananda Tandava shows Him dancing the universe into existence, sustaining it with His rhythm and dancing it to extinction. Creation is sparked by the vibration of the drum in the right hand; protection of sustenance by the open palm of the front right arm, a gesture of assurance that grants freedom from fear. The fire in the left arm dissolves the universe while the front left arm points downward to the lifted left leg, the solace of the worlds. The dwarf representing ignorance is trampled under the right leg. The aureole represents the cosmos, the sun, moon and stars revolving in perpetual and fiery motion. Ananda K. Coomaraswamy, seeing beyond the unsurpassed rhythm, beauty, power and grace of the Nataraja, once wrote of it "It is the clearest image of the activity of God which any art or religion can boast of". More recently, Fritjof Capra explained that "Modern physics has shown that the rhythm of creation and destruction is not only manifest in the turn of the seasons and in the birth and death of all living creatures, but is also the very essence of inorganic matter", and that "For the modern physicists, then, Shiva's dance is the dance of subatomic matter". It is indeed as Capra concluded: "Hundreds of years ago, Indian artists created visual images of dancing Shivas in a beautiful series of bronzes. In our time, physicists have used the most advanced technology to portray the patterns of the cosmic dance. The metaphor of the cosmic dance thus unifies ancient mythology, religious art and modern physics". S The Singer and DocJ96 added this photo to their favorites.